We offer drama training workshops to equip others to share their faith in a creative and relevant way. 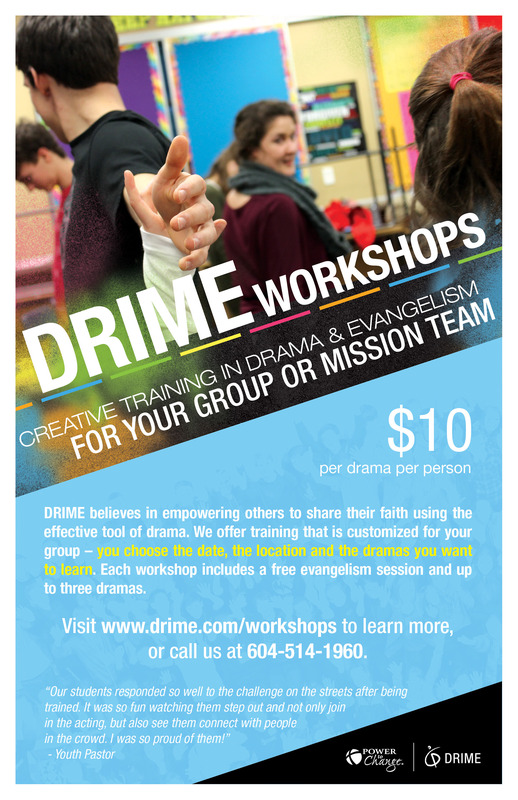 DRIME workshops are ideal for short-term mission teams, youth teams, drama teams, or anyone interested in learning more about creative evangelism. The workshop is customized for your group — you choose the date, the location and the dramas you want to learn. Each workshop includes a free evangelism session and up to three dramas. To register, fill out the form at the bottom of this page. Complete the following registration form for your group. You will receive an email within a couple of business days to confirm your workshop date. Required fields are marked with an asterisk (*). Questions? Email info@drime.com or call 604-514-1960.